Balance between the good and the evil must be maintained in order to keep the world natural and happening, and the court of Akbar was no exception to that. There were people who admired the wit and wisdom of Birbal, including the emperor himself; so were the people who got jealous from the same and always waiting for something which could defame Birbal. As a political expert, Akbar knew these things and how to tackle them too. In his view it is better to let those events (to defame Birbal or to challenge his wit and wisdom) happen, and the qualities and cleverness of Birbal will be self evident (from the result of such incidents) that he indeed possess such great qualities. So many such incidents happened then after and Birbal every time conquered the situation by his wit and wisdom. And every time it was proven that why Birbal was appreciated so much! Not only the courtiers like Mulla Do Pyaza and others but also the second begum of Akbar, Shahbano and her brother Fannekhan were also the part of the brigade acting to place Birbal in some challenging situation, waiting to get him defamed! There is a proverb in Hindi that “Sari Khudai Ek Taraf, Jhoru Ka Bhai Ek Taraf” (which means the brother of the wife is equivalent to the rest of the world – he should be treated well amongst everything else). Hence Akhbar need to treat the incidents raised by Fanne Khan and Shahbano wisely. One day when Akbar visited Begum Shahbano he sensed the fire coming from within her. In order to get to the root cause of the same, Akbar talked her calmly and lovely. This way he made her speak her heart. She asked that she have no questions about the post and respect awarded to Mansinh – the brother of queen Jodha, but promoting Mahesh Das so much by awarding him the title of Birbal and considering him as of the nine gems of his court by Akbar is something she cannot digest. (She thought that her brother FanneKhan also possess such great qualities but was avoided by the emperor.) She wanted to know from Akbar that doesn’t he find anyone else (rather than Birbal) of such calibar? Akbar wanted to confirm the person she was talking about. She finally proposed the name of her brother FanneKhan. She was thinking that Fanne Khan has the qualities (a sister always think the same for her borhter) but they are not seen by Akbar and not praised at all. His brother is under estimated somehow by Akbar almost always. By hearing the complaint Akbar asked her to call her brother FanneKhan to meet him so he can evaluate his qualities and do justice to him. After a conversation with FanneKhan and Begum ShahBano finally it was decided that there will be a duel of wisdom between Fanne Khan and Birbal arranged. Shahbano insisted the dual to happen at her palace rather than at Akbar’s court as she was keen to see Birbal’s defeat in front of her. Akbar forewarned FanneKhan about the qualities of Birbal and confirmed that the demand of queen ShahBano would be taken care of . Begum ShahBano knew that Birbal was indeed very intelligent and clever and advised her brother to take the deal seriously. Over confident FanneKhan asked his sister to not to worry and assured her that he is capable to won the battle and tomorrow it would be proved. However as soon as Begum left the room and FanneKhan got glimpses of her maid Gulbadan, he went out of his control. Despite of his being a respected fellow in the administration (as he is the brother of Begum Shahbano, not due to his qualities) and Gulbadan was just a maid, who is continuously avoiding him (because of his foolishness) he had fallen for her. Actually he is fallen for every woman he see! He was overjoyed and asked Gulbadan that he will have the battle of wisdom tomorrow against Birbal and as soon as he won it (he was so sure) he will ask the delighted emperor to let him marry Gulbadan, which the emperor will grant permission for sure! One cannot decide whether to laugh on the funniness of FanneKhan or should feel pity for him! Shahbano though caught him flirting with her maid and asked him that better to prepare for the duel instead. The duel started at Shahbano’s palace as per her demand and Birbal and FanneKhan was the competitors! Akbar presented four persons and four questions and asked Birbal and FanneKhan to relate those questions (or rather phrases) with these four people. 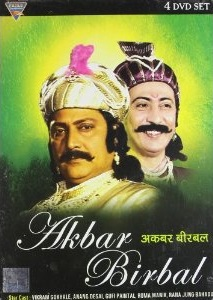 Fannekhan thought that the questions are dead easy and hence Akbar gave him the first chance to solve them. FanneKhan however got confused and finally accepted that he didn’t know the answers of the question anyway!!! What were the questions? Who were the four people brought by Akbar in the palace? Was Mahesh Das able to answer the questions satisfactorily? (Of course, we all know here the answer is YES). Well, it is better to watch the episode to know the answer and feel the Birbal’s wit and intelligence yourself. The DVD quality is good, the dialogs are small yet impactful. Akbar’s wardrobe was having some rather bright colors for a man. But one cannot complaint about that. The seasoned actors like Vikram Gokhle, Anang Desai and Rana Jung Bahadur delivers the performances expected from them and Roma Manik is equally competent. Overall a watchable experience for sure.